The Football Front: Just how Good is Kyle Walker? Kyle Walker has had a fantastic season. That can’t be denied. The 21 year old has been consistent, solid and has offered quite a bit going forward for Spurs. But for me, some of the love and admiration towards Walker has gone overboard. I mean totally overboard. 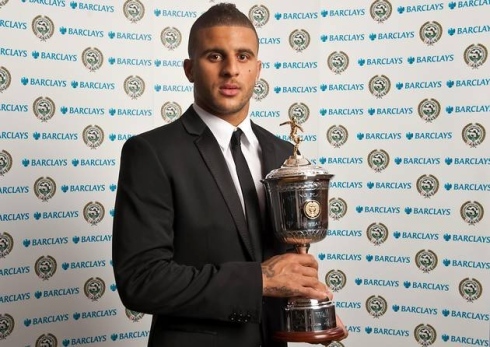 Recently, Kyle Walker was named the PFA Young Player of the Year, ahead of the likes of Sergio Aguero, Juan Mata, Gareth Bale and others. To me and to many of you, this left us all a little bit dazed. Has he been THAT good this season? To beat the likes of Bale, Aguero and others to the Young Player of the Year gong? I don’t think so.. Indeed, he has been very good, especially considering he is only 21 years of age. But for him to then be named in the PFA team of the year, suggests one thing. It suggests he has been the best right back in the division. The players to be analysed are of course, are KyleWalker, his England main counterparts at right back, so the likes of Glen Johnson and Micah Richards. The right backs to be analysed are Arsenal’s Bacary Sagna, Chelsea’s Branislav Ivanovic and my wild card, Kyle Naughton. Kyle Naughton was chosen for two reasons. Reason number one being the player is currently on loan from Tottenham, and secondly, he is a young (23 years old) English right back just like Walker. Apologies for the bluriness, Excel and Blogger seem to hate me. There’s no better place to start than looking at the tackles made and their success rate. Walker made the second highest amount of tackles out of the players analysed, but his success rate is very impressive. Walker won 82.76% of his tackles, only Bacary Sagna has won more. Walker’s tackle success rate demonstrates just how good a right back he is. If you compare his tackle record to the likes of Glen Jonhson and Micah Richards, Walker dominates. But if we look at the ground dual records of the players, Walker sits a little below average. But it has to be noted Walker has made the most ground dual attempts, so perhaps it’s expected he would have lost a few more. But on the other hand, if Walker had made lots of ground dual attempts and won a great deal more, it would have been an outstanding record for the 21 year old. Walker’s ground dual win of 58% is level with Man City’s Micah Richards. And the only player who has a worse record than 58% is current first choice England right back Glen Johnson. But comparing Walker to Ivanovic, Sagna and Naughton for ground duals, the PFA young player of the year lags behind. The most successful ground dual winner was Ivanovic, with Sagna and Naughton in joint second with 62%. What’s intriguing is that Kyle Naughton, 23, on loan from Tottenham finds himself right near the top of the pack for ground duals, while his highly rated team mate at Spurs, finds himself at the other end of the spectrum. Of course, for any defender, be it a centre back, or a full back, aerial prowess is crucial. Walker, the 5 ft 10 inch right back, has the worst aerial win percentage. Perhaps you could put it down to Walker being relatively small in height. But, Sagna, a man who is 5ft 9, one inch smaller than Walker, the Arsenal man has won a very impressive 70% of his aerial duals. Only 6ft 2 Branislav Ivanovic and Micah Richards have won more. But comparing Walker’s aerial abilities to the English lads, Johnson, Richards and Naughton, the Spurs man is left lagging behind again, all the other English lads have won at least 60% of their aerial duals, while Walker manages 58%. It comes as no real surprise Richards takes the lead out of the English players in regards to aerial prowess, but the Tottenham man’s aerial record demonstrates the young man has a lot of improving to do in the area, in order for him to become a defensively well rounded right back. The most alarming Kyle Walker defensive stat for me is the defensive errors section. Personally, to be seen as the best right back in the division, you’ve got be consistent all season and you can’t make any major defensive errors and you can’t be easy to exploited. But Walker and Johnson, are the only players analysed to have made defensive errors this season.This points severe question marks on whether Walker has really been the best right back in league and whether he’s been the best young player in the division. Furthermore, this is developed further by the fact Walker has been dribbled past 20 times this season, only Naughton had been dribbled past more. But one could put the high number of defensive errors and dribbles past down to a lack of experience. After all Kyle Walker is the youngest of the analysed players. He will of course make wrong decisions and make mistakes, he is a 21 year old! But making defensive errors and being in the team of the year is rather outrageous to me, especially given the Premier League has many talented right backs that have been consistent all season, without making errors, such as Micah Richards. Surely to be in the team of the year you have to be excellent consistently? Defensively, the stats show Kyle Walker has not been as solid as other right backs in the division. But with the same token, they also show he has not been shocking defensively. Instead the figures demonstrate Walker is a talented right back who is very competent at his defensive work. But it’s clear, there is quite a bit of room for improvement. But for 21 years of old to have one of the best tackle success ratio’s shows clearly Walker is a talented defender, with potential. It is crucial he builds on it. Of course, a sign of a good full back is one who can not only defend brilliantly, but one who can bomb forward and create chances for his attacking players. If we look at passing first, we can see all of the full backs have made a high number of passes, but no one has made more passes than Kyle Walker. The Spurs man had a pass completion rate of 84% which is very tidy. This is a crucial part of Walker’s game, he can keep the ball and pass it well meaning he is a very useful player to have in the build-up of attacks. What’s intriguing is that Walker is the second most accurate passer, alongside England rivals Johnson and Richards. All three men’s good passing abilities can only mean positive things for England. The reason why I think Kyle Walker is so highly rated is because of attributes such as his speed, directness and stamina. Indeed, these attributes allow him to bomb on forward and continuously help Spurs attack. It comes as no surprise the 21 year old has created 31 chances, the highest out of the selected right backs. That figure is very impressive, given this is his first full season in the Premier League. Walker’s chances created figure highlights his confidence in his abilities and his desire to dominate the right hand side. Furthermore, in some respects it shows his attacking potential too. For a full back to be very solid defensively, but still have the ability to bomb on forward and create, it shows how, as his game develops, he could become a highly skilled commanding right back. But some of you may be thinking, Kyle Walker has only assisted once this term, while Richards has managed to assist 5 times. So he can’t be that great going forward. This is very true, but an assist demands two things from two players. Firstly, it demands a good ball in, secondly to complete an assist, it of course demands the attacker to put the ball into the back of the net. I feel more can be learnt about the attacking nature of a player by the number of chances he creates, and Walker creates a huge amount. But on the other hand, you have Richards, who has created who has created 14 chances and assisting 5 times more than Walker. Does that mean Richard’s final ball is far better? Personally, I’m unsure, Richards assist record compared to Walker’s record highlights the difference in attacking quality between Man City and Spurs. As the chances created and assists record combined tell us on the whole the Man City players took the chances created, while the Spurs players didn’t. But for Walker to create 32 chances is very encouraging and if he can continue to improve, Spurs have one hell of a right back in their hands. For me, a good full back is one that can cross effectively. The PFA young player of the year’s crossing accuracy sits as the lowest out of the players analysed, alongside, the highly rated Micah Richards. But an 18% crossing accuracy isn’t that bad at all, in comparison to other players in the division. But it’s transparent Walker has a lot of improving if he is to be at the Branislav Ivanovic level of crossing accuracy. Chelsea’s Serbian has a 31% crossing accuracy which is absolutely brilliant. But what’s interesting is that Kyle Naughton’s crossing abilities are very impressive too. At 22% he finds himself having a better accuracy than all three England right backs and being one percent below the sensational Sagna. One wonders if Naughton is given a chance at Spurs, will his abilities get more recognised, because his statistics paint a picture of a very mature, solid right back who can offer a good outlet on the right flank. Comparing the two Kyle’s is crucial. Indeed, both players are of similar age, (Naughton 23, Walker, 21) but more importantly, they play for the same team. And after such a solid season on loan at Norwich, you’d think Harry Redknapp would seriously consider keeping Naughton at Spurs next season. But comparing the PFA young player of the year, to Naughton shows a rather compelling picture. Defensively, Naughton dominates Walker in some key areas. The Norwich man has a better win percentage of ground duals and aerial duals. But Walker shows some fight, by winning more tackles, making more interceptions and being less able to dribble past. However, Naughton’s defensive stats show a man who is solid, reliable and very mature. And even going forward, Naughton offers more than Walker in terms of crossing. For me, without a doubt Kyle Naughton is severely underrated, and if he continues the good work he has done I’m sure he will be touted for England sometime next season. But comparing the Walker to Naughton, there isn’t much between them. Both are very solid defensively and both offer quite a bit going forward. The progress of both players is great news for Tottenham, it means the club have quality and depth at right back. It will be interesting to see how Naughton manages at a bigger club, if he stays at Tottenham that is. At Norwich, there is less of an expectation to bomb forward and be solid defensively too. Comparing Walker to Richards and Johnson is vital too. Given how these three are competing for the right back spot for the euros. But again, there isn’t much between them. Defensively, one would have to say Richards is the strongest. He has won the most aerial and ground duals. But Walker shows his great strengths are tackling and his reading of the game, two areas where he dominates Johnson and City’s Richards. Perhaps at the Euros, Hodgson may look at Walker’s tackle success and his interception record. As it shows the 21 year old reads the game very well, and he can also execute fine tackles on his opponent. But even going forward, the three England rivals are very very similar. For example all three men have an identical 84% pass accuracy ratio, while in terms of crossing, they have a very similar crossing accuracy. For me, all three right backs are very good footballers, but to pick one for England is not an easy outright decision. They all offer different things, Johnson offers experience and fair. Richards offers power and tenacity. While Walker blistering pace and good reading of the game. It all comes down to taste and preference at the end of the day. So, is just how good is Kyle Walker? To keep the answer short and simple, he is very good. For just 21 years of age, he has shown great consistency, great tenacity and great confidence. Walker’s defensive solidity alongside his determination to go forward shows he is a decent well round full back. What’s encouraging for England and Spurs fans is that the player is still very young and you’d think he can only improve with experience and time. His raw skills such as his pace make him such a useful asset to have. It allows him to suddenly support from defence to attack, while it also allows him to keep up with the trickiest of wingers or strikers in the division. But has Kyle Walker been the best right back in the division? The answer to that is no. He hasn’t. He has been very effective, but by no means has he been the best right back or is he the best right back in the Premier League. Walker has quite a bit to improve on if he is to become the best right back in the division. He firstly has to win more ground and aerial duals; he certainly has to be rid himself of defensive errors too. In terms of going forward, Walker has to work on his crossing and creating better chances for his team mates, because at the moment as much as he creates, the quality of his final ball is questionable. But with age, experience and the right coaching, his final ball improve. But let’s be honest, Kyle Walker has the potential to be the leading right back in Premier League. This season he has shown just how good he is, but now he needs to focus on the weak spots of his game. But for me, the best right back in the division is Bacary Sagna. His defensive solidity, alongside his great offensive nature makes him one of the most creative and effective full backs in the division. One thing which separates Sagna from the other right backs is that he fully understands his role as right back. And this is demonstrated by his very impressive defensive statistics. Furthermore, a sign of a quality full back is in most of the variables analysed, he finds himself top or near the top of the spectrum. It highlights the Frenchman is abilities are well rounded and there is no clear defensive or offensive weakness in his game. Kyle Walker should aspire to make his game well rounded like his Arsenal counterpart. But the 21 year old is well on the way to doing that. If and it’s a big if he maintains the same desire to learn and develop. This season Kyle Walker has not been the best right back in the division, nor has he been the best young player. Walker has had very secure, solid and stable season. That’s all.